eHealth Consortium is pleased to announce a free seminar in 2014 for members and the public, with the aims to boost the awareness of ehealth adoption for improved care delivery. Limited seats available, REGISTER NOW! In Hong Kong, pharmaceutical supplies involves different stakeholders. Over 90% of pharmaceutical products are imported from overseas. How to ensure the right products are supplied from the manufacturers to the right patients in the right quantity and right quality requires the collaboration between a lot of parties. Senior Director of Operation and IT of Zuellig Pharma with over 20 years experience in this market. Zuellig Pharma is the leading pharmaceutical and Healthcare distributor in Hong Kong and Macau marketing. Zuellig is also a long term partner with HKAPI and GS1 to promote the effective and efficiency of supply chain of pharmaceutical industry. Previous project such as EDI PO project and recently the HA supply chain modernization project. Nowadays, it is common to have printing devices nearby in healthcare organizations. In order to better manage the resources for both staff and guests to streamline the processes and enhance efficiencies, Ricoh has launched a Bring Your Own Device (BYOD) solution for healthcare professionals and guests to use the Wi-Fi services not only limited to printing and scanning but also broadcasting and file sharing under a simple but secure, scalable and cost effective environment. 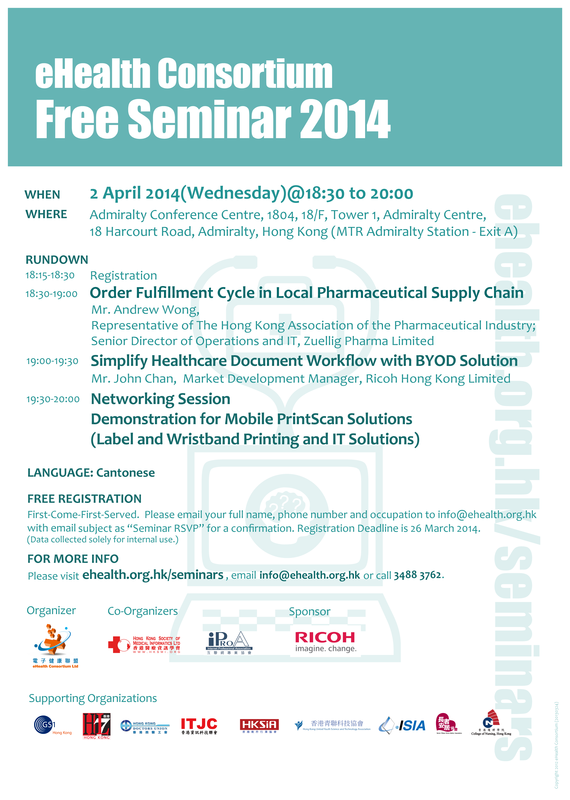 Ricoh will also show you the challenges of implementing BYOD solution faced by healthcare organizations. Established in 1963, Ricoh has faithfully served Hong Kong businesses for over 50 years and is specializing in office imaging solutions, production print solutions, document management systems, IT and communication solutions. Ricoh offers healthcare institutions end to end solutions and help customers to digitize the patient records, streamline information and administration processes, strengthening IT infrastructure, address security initiatives, and reduce operational costs. John has been working in the IT industry for more than 15 years. He is also experienced in implementing management solutions and administration system in various industries. Currently, he is responsible for developing Ricoh healthcare solutions e.g. remote diagnostic, label and wristband printing as well as digital surveillance for healthcare sector by integrating different IT technology to fulfill the industry needs. Deadline for registration is 26 March 2014.
eHealth Consortium is pleased to announce a quarterly seminar series in 2014 for members and the public, with the aims to boost the awareness of ehealth adoption for improved care delivery. (Updated on 06 March 2014) Stay tuned for information on our next seminar!